COSTA Cruises opens its fourth season in the region with the announcement that two top-of-the-range vessels will be taking to the Gulf waters. February 23 during her inaugural cruise. The ship will depart from Savona on February 5 and will call at Dubai from February 23 to 26. 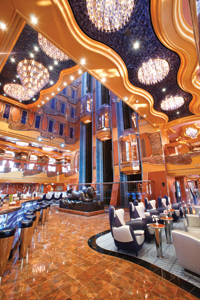 Costa’s guests cruising on the first leg of the journey will be able to attend the naming ceremony. The two top-of-the-range vessels will sail seven-day itineraries consisting of two nights in Dubai and one day calls at the ports of Muscat, Oman, Fujairah, UAE, Abu Dhabi, UAE, and Bahrain. Costa Deliziosa will be departing from Dubai on Sundays from March 14 to May 9 and Costa Luminosa set sail on December 12, with trips running through to April 10, 2010. In addition to the two Costa fleet jewels, the smaller Costa Europa will be offering a brand new route: 18-day winter cruises from Savona to Dubai and from Dubai to Savona - a unique itinerary crossing the Mediterranean, the Suez Canal and the Red Sea.